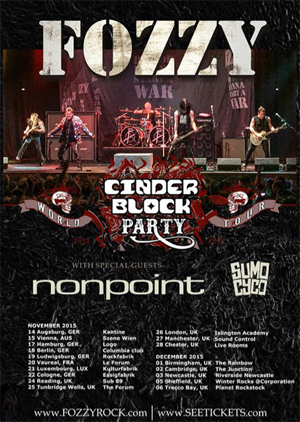 NONPOINT have announced that they are heading over to Europe in November to support FOZZY on their tour. The tour opener will be SUMO CYCO. "Looking forward to get face to face with our friends and fans that have been waiting for years to see us play in their town. We are playing every song they're waiting to hear so nobody is going home disappointed!" NONPOINT's latest album, The Return, Wwas released in September of 2014.